One of seventy-nine shortlisted buildings that have won the prestigious 2017 American Architecture Awards ® for the best new buildings designed and constructed by American architects in the U.S. and abroad and by international architects for buildings designed and built in the United States. The Petersen Automotive Museum in Los Angeles reopened this week following an extensive renovation, featuring a new wavy steel and aluminium facade designed by Kohn Pedersen Fox. The captivating facade has been criticsised as window-dressing. Published on 4 Dec 2015 – Watch 15 months of progress for the Petersen Automotive Museum in Los Angeles, CA, zoom from start to finish line in just 60 seconds with this time-lapse movie. From September 2014 to December 2015, construction cameras documented the striking new redesign, which features eye-catching steel ribbons that curve around the entire exterior. The exterior is illuminated by 866 individually controlled LED fixtures. 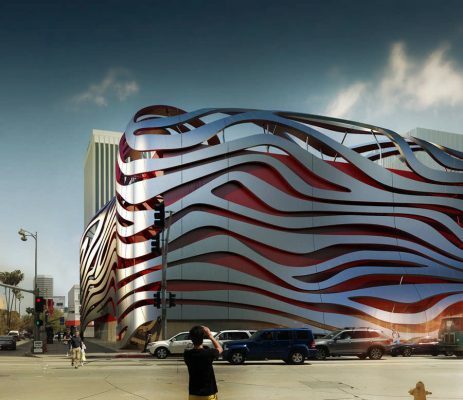 New York, NY – August 28, 2013 – International architecture firm Kohn Pedersen Fox Associates (KPF) is pleased to share its exciting design for the new Petersen Automotive Museum in Los Angeles. The museum will mark its 20th anniversary in 2014 by commencing a complete exterior transformation and a dynamic redesign of the interior, resulting in a world-class museum that will showcase the art, experience, culture, and heritage of the automobile. Opportunely located on “Museum Row” of the famed “Miracle Mile”, the building actually started out as a department store in 1962. Its new design will transform the Petersen building into one of the most significant and unforgettable structures in Los Angeles – an appropriate home for such an impressive collection of automobiles. Unlike most museum renovations, which involve complete building teardown, this is a repositioning project. The existing building is like a chassis without a body. By keeping the bones, but removing the existing concrete portico on Wilshire, and installing a corrugated aluminum rain screen outboard of the current facade on each of the three street frontages, the museum will have a whole new look and feel. New “ribbons” made out of angel hair stainless steel on the front and top, and red painted aluminum on the back and bottom, flow over and wrap the building. Acting as beams that support their own weight, these evoke the feeling of speed and movement, sitting atop the existing structural system much like the body of a car mounts to its frame. At night, the color and forms will be lit from within to accentuate the steel sculpture and act as a beacon on The Miracle Mile. Los Angeles is a city that was brought to life by the automobile. The idea of Los Angeles architecture invokes thoughts of the mid-century modern movement led by Architects such as John Lautner, and Wayne McAllister. This modern and space age architecture, known as “Googie”, is characterized by upswept roofs, curvaceous shapes, and bold use of glass, steel, and neon. This style of architecture was influenced by car culture, suburban life, and the Atomic age. Because of increasing car ownership, cities no longer had to rely on a central downtown and business could therefore be interspersed with residential areas. Work on the museum is expected to take 14 to 16 months and to be completed in early 2015. 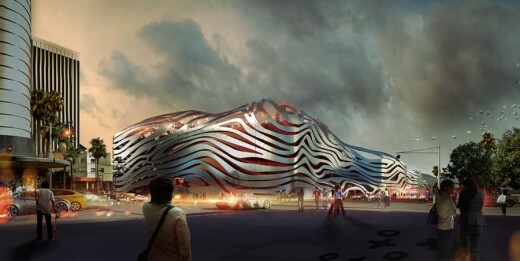 The Petersen Automotive Museum Foundation is a non-profit 501(c)(3) charity. The Museum is located at 6060 Wilshire Boulevard (at Fairfax) in Los Angeles, California 90036. Admission prices are $15 for general admission adults, $10 for seniors, $10 for students with ID, $5 for children ages 3 to 12. Museum members, active military with ID and children under three are admitted free. Vault tours are available for an additional $25, and are offered on a first-come, first-served basis. Parking is free for the first 30 minutes and $2.00 each additional 30 minutes. One hour validation with purchase of $10 or more in the Museum Store or Johnny Rockets located in the museum lobby. Museum hours are Tuesday through Sunday from 10am to 6pm. For general Museum information, call 323/930-CARS or visit the Museum’s Web site at: www.petersen.org. Kohn Pedersen Fox Associates (KPF) is one of the world’s pre-eminent architecture firms, providing architecture, interior, programming and master planning services for clients in both the public and private sectors. Operating as one firm with six global offices, KPF is led by 24 Principals and 21 Directors. The firm’s 600+ staff members come from 43 different countries, speak more than 30 languages, and include over 80 LEED accredited professionals. KPF’s diverse portfolio, which features over 70 projects certified or pursuing green building certification, comprises corporate, hospitality, residential, academic, civic, transportation, and mixed-use projects located in more than 35 countries.